A seamless GST return filing & billing experience with HostBooks GST! Disclaimer : Please verify the HSN/SAC code provided by the HSN/SAC Search before using it for your business. We disclaim all liabilities arising out of the HSN/SAC Search. 1. Is it mandatory to provide HSN/Service Accounting Codes? You are required to provide a minimum of just one good or service (one HSN or Service Accounting Code). 2. I know the HSN Code, how do I add Goods or Services while in the Registration process? In case you deal with Goods or Commodities, you need to mention the HSN Code in the Goods tab. In case you deal in services, you need to mention the Service Accounting Code in the Services tab. You can add maximum 5 goods and 5 services. In case, you have more than 5 goods or services, you must add the top 5 goods or services you are dealing in. a. In the Search HSN Chapter by Name or Code field, enter the first four-digit 6105 from the HSN Code. 3. I don’t know the HSN Code for any of the products I supply. What do I do? The Goods and Services section of the new registration application has a built-in online utility that will help you select the HSN Code. For the Goods section, simply start typing the type of product under Search HSN Chapter by Name or Code and there will be a drop-down from which you can select the relevant chapter. Once you have selected the chapter, start typing in the Search HSN Code field and select the type of product. The HSN Code of the goods will be auto-populated in the application. You can repeat the same if you want to enter details for more than one good. Let us take an example where the dealer deals in cotton textile. 4. If you have registered for GST under one HSN code, can you sell products of another HSN code without registering for the same? HSN code will be the same in case of any substitute product selling while if the traders start selling any different kind of product then he must amend the registration of new HSN code of the product. 5. What is the HSN code for chat-type food items? There is no specific HSN code dedicated to stalls and Indian street food. However, there is related HSN code on the material and food items included while preparing such kind of edible items. 6. What are the HSN codes for building materials like Rodi, Badarpur, etc., under GST? 6813 HSN For Building Stones:- Friction material and articles thereof (for example, sheets, rolls, strips, segments, discs, washers, pads), not mounted, for brakes, for clutches or the like, with a basis of asbestos, of other mineral substances or of cellulose, whether or not combined with textiles or other materials. 28% GST rate is applicable. 7. What is the HSN code for hotels and restaurants? 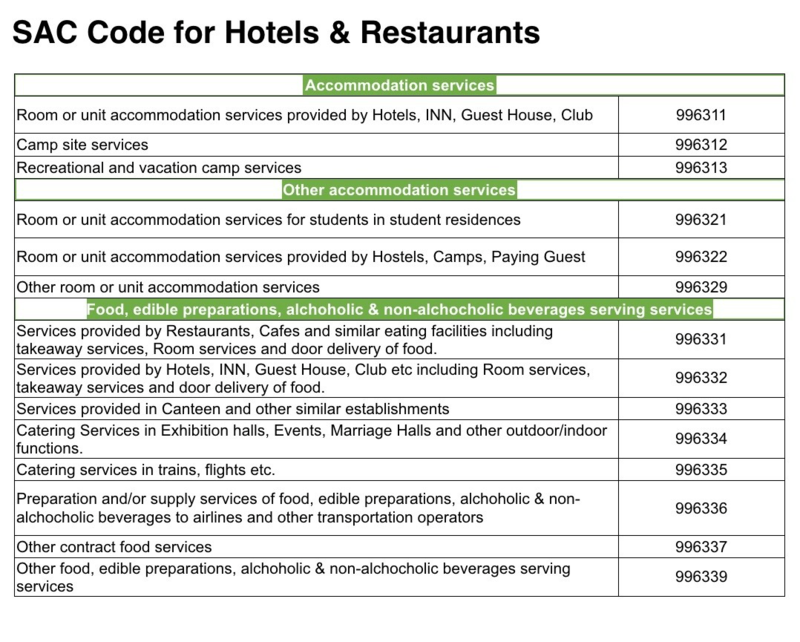 Hotels and Restaurants is a service industry, and therefore, SAC codes will be applicable here, not HSN codes. You can find SAC/HSN code for this and more on the internet. Check the image below for detailed SAC for the restaurant industry. 8. What is the HSN code for textile work in GST? The textile work is a kind of service, not product, so you will need SAC, not HSN code. SAC for textiles job work is 9988 which includes - Textile yarns (other than of man-made fibers) and textile fabrics. 9. GST rate and HSN Code for Agricultural products purchased directly from the farmer? GST on agricultural products varies from 0% and 5%. GST normally on agricultural products is nil, which includes products like tomatoes, potatoes, live trees and other plants, leguminous vegetables, dried vegetables and other vegetables fresh or chilled. (b) bearing a brand name on which an actionable claim or enforceable right in a court of law is available [other than those where an actionable claim or enforceable right in respect of such brand name has been foregone voluntarily], subject to the conditions as in the ANNEXURE]"
4. Herb, bark, dry plant, dry root, commonly known as jaribooti and dry flower. 10. I am selling students printed course books (printed on xerox copiers) to colleges, what is GST rate, and HSN code? "Other printed matter, including printed pictures and photographs; such as Trade advertising material, Commercial catalogues and the like, printed Posters, Commercial catalogues, Printed inlay cards, Pictures, designs and photographs, Plan and drawings for architectural engineering, industrial, commercial, topographical or similar purposes reproduced with the aid of computer or any other devices."